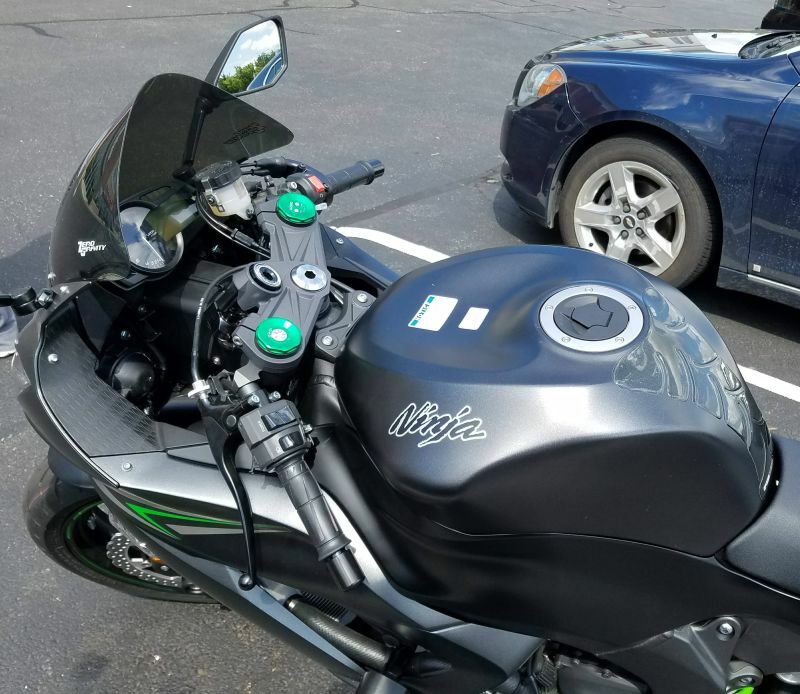 As I formulated this article, I realized that mounts for Kawasaki Ninja motorcycles is a bit more challenging than other models. The obvious variety of models made over the years means one mount is not going to fit all of the Ninja models. We will discuss mounts that fit most models and I’ll try to provide enough detail to allow you to determine if this is the right mount for your situation. As mentioned in other articles on this topic, motorcycle owners like to mount things on their bikes. The most popular items mounted are cell phones and GPS units. I also see some that mount cameras, satellite radios and even drinks. While the most popular mount for most motorcycles is the handlebar, that is not necessarily the case for the Kawasaki Ninja because handlebar real estate is scarce if there is any at all. I receive a few questions regularly regarding the potential use of a suction cup on a motorcycle on places like the gas tank which I do not recommend as the vibrations can easily compromise the effectiveness of the hold of a suction cup so please avoid these types of mounts. Let’s discuss some mounts that are popular with Kawasaki Ninja motorcycle owners. The most common place for mounting devices on your Ninja is the fork stem. A motorcycle stem mount (also known as a fork stem) typically fits the steering stem hole in the top triple clamp assembly. By adding custom or universal cradles, the stem makes a nice location for mounting small devices such as cell phones, radar detectors and GPS units. Typical instructions involve inserting a stem accessory which is manufactured by mounting companies specifically for this purpose. Some stem mounts are made of multiple parts and are fastened with machine screws into the stem. Other stem mounts are manufactured of a thick rubber component and the mount is twisted tightly into the stem hole. Be sure to read the manufacturer’s instructions carefully prior and during installation to ensure that the mount is installed properly and securely. TechMount manufactures a good Universal Motorcycle Fork Stem Mount Kit. The universal stem mount system comes equipped with six stem shafts with varying diameters, each being a different diameter to fit virtually all-steering stem holes. Select the right size for your stem and slide it down into the top of the fork steering stem. The stem adapter includes an O-ring, which progressively gets tighter as you slide it slides it into the stem shaft, keeping your device attached securely to your motorcycle. The TechMount stem mount kit has a 17mm ball at the end which ironically is the same size used by a Garmin Nuvi GPS cradle. So for many GPS units, this might be all that is required. If you would like to add a universal phone cradle to this mount, there are many options. The TechMount Cradle Kit with included safety bungee has a 17mm adapter that will fit over the ball on the stem mount. The resulting cradle installation sits roughly an inch off the stem. RAM Mount also makes a motorcycle Motorcycle Fork Stem Base with 1-Inch Ball. Unlike TechMount these mounts come with a single ball assembly and you will need to do some trimming to customize the fit to your stem diameter. The mount includes the one inch ball that is universal to most RAM Mount systems. You will find this base bundled with a variety of cradles. Consider the Fork Stem Mount with Universal X-Grip Phone Holder. We wrote a very detailed article on the X-Grip series and you can read it here. There are a few Kawasaki Ninja models such as the 250R that have a small amount of real estate available hear the base of the handlebar. The RAM Handlebar Mount only needs a little less than an inch of space can be supplemented with a custom or universal cradle to fit a GPS or phone.